Rarely have any scandals or misdemeanours been reported in 47 years of ISRO. The last time ISRO was in the news for wrong reasons was in 1994 when two senior scientists of the organisation were charged with espionage. The scientists were charged with selling national secrets to a foreign country. But no charges were proved against the two, and the main accused were declared not guilty in 1998. But the Antrix-Devas deal worth Rs 1,400 crore, which came under CAG scanner in 2011, has since become ISRO's biggest crisis ever. It's biggest ethical and financial crisis. ISRO has been accused of financial bungling, has been asked to pay Rs 4,400 crore to Devas multimedia. And now CBI, which was charged with investigating the case, has booked several people including the ex-ISRO chairman G Madhavan Nair. While we wait to see what happens next, Catch gives you a lowdown of the Antrix-Devas deal. An agreement worth Rs 1,400 crore is struck between Antrix Corporation (ISRO's commercial arm) and Devas Multimedia (a company formed by former ISRO scientists and US venture capitalists) which was to give Devas first mover's advantage in satellite telephony market. Devas was given a 12-year lease of 90% transponder space on two satellites, G-SAT6 and G-SAT6A in the S-band spectrum, which is a highly valuable commercial commodity. It was allowed the use of 70 MHz to launch satellite-based applications on mobile devices. About a year after the deal was announced, CAG raised doubts about the fairness of the deal. It estimated a loss of Rs 2 lakh crore to the exchequer due to loopholes the deal. 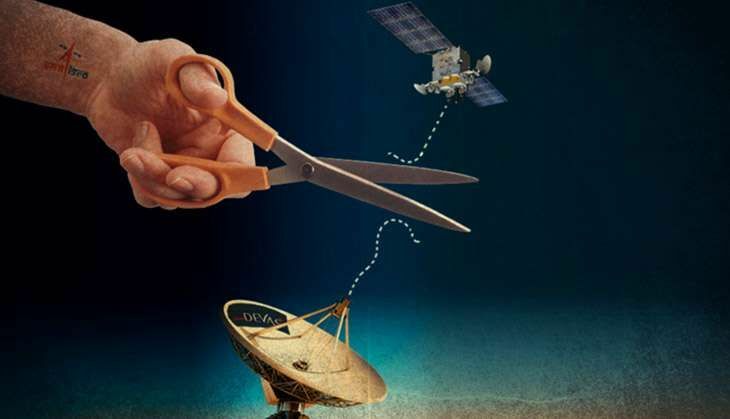 It observed that S-band was allocated without competitive bidding and that the government and public at large were not properly informed about the deal. The S-band spectrum, which was allotted to Devas, had in 2010 been auctioned for 3G mobile services. Just 15 MHz of S-band spectrum had earned government Rs 67,719 crore. This is the scale that CAG used to compute losses due to Antrix-Devas deal. A day after the CAG report details became public, ISRO, decided to annul the agreement. The then ISRO chairperson S Radhakrishnan said the agreement was cancelled because the S-band, a scarce resource, was needed for larger "national and strategic" purposes. Antrix filed an arbitration suit in Bengaluru in November 2015 against the September 2015 order of the ICC arbitration court asking Antrix to pay damages of $672 million to Devas Multimedia. CBI and ED get into the picture. Investigations into the deal restart. CBI registers cases against former officials of Antrix for cheating, criminal conspiracy and corruption. CBI said that Devas' Board of Directors changed within 6 months of the deal. Antrix did not verify the change and suppressed facts for getting clearances from the cabinet. The Enforcement Directorate also registered cases of money laundering to investigate the deal. CBI questioned ISRO ex-Chairperson Madhavan Nair on the Antrix-Devas deal. Antrix is slapped a fine of about Rs 4,400 crore ($672 million) by International Arbitration Court for unilaterally terminating the contract with Devas. CBI claims that Devas Multimedia Private Limited allegedly made "wrongful" gains of Rs 578 crores with the help of Antrix, the marketing arm of ISRO. Nair was the Chairperson of ISRO in 2005 when the deal was signed. ED issues a showcase notice to Devas Multimedia Private Limited for allegedly violating the Foreign Exchange Management Act (FEMA). The probe agency accuses Devas of accruing Rs 1,200 crore by violating the FEMA provisions. The ED said Devas received funds from various offshore firms like CC Devas Mauritius Limited, Telecom Devas Mauritius Limited, Deutsche Telkom Asia Private Limited and Devas Employees Mauritius Private Limited. Government loses the arbitration case going on at the Permanent Court of Arbitration at the Hague. The estimated fine that government of India on behalf of ISRO for cancelling the deal with Devas could be to the tune of $1 billion. The government responds by telling media that the order is being examined and "legal recourse will be taken". PCA in the Hague had ruled that the Indian government had acted "unfairly" and "inequitably" in cancelling the contract involving the use of two satellites and spectrum. Former ISRO chairman G Madhavan Nair is named in a chargesheet filed by CBI. The chargesheet, filed in the Delhi court of special judge Vinod Kumar, also names the former executive director of Antrix, K R Sridhar Murthi, the then president and CEO of Devas Multimedia, Ramachandran Viswanathan, and some other officials. Also read: Could the Devas Multimedia case be ISRO's worst crisis ever?